Okay, I just threw on a 8 lb packer which likely was around 7 pounds after trimming. I'm pretty sad at myself for buying it because the point was very tiny in comparison to the flat. Oh well, it was only $20 and it gives me something to do when the family is out of town. Well, here it is. 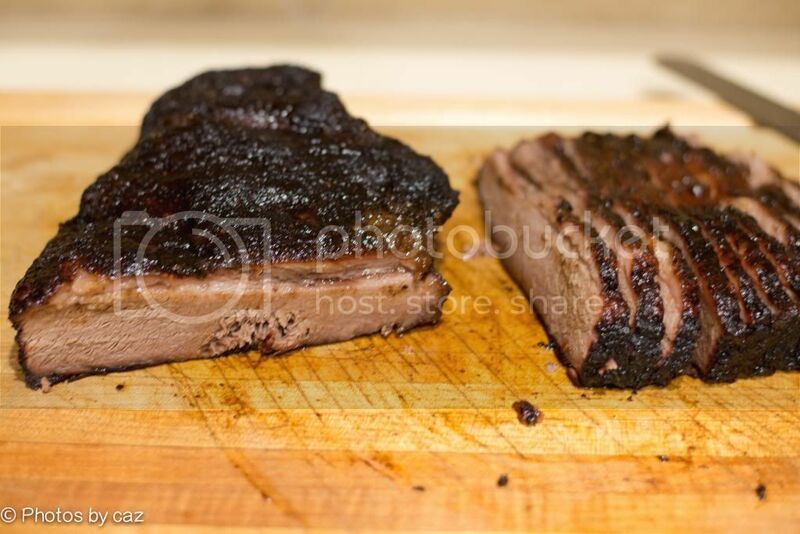 Probably the best brisket i've made to date. I definitely need a better knife (or a Ken Onion) or something. I had trouble cutting through the bark, even though it wasn't very hard. I also missed a couple spots on my trimming as I left a lil too much fat in one spot that didn't render properly. Before I pulled it off. So here is the funny thing. I made this massive sammie and I had to do the Triple D mouth open to shove it in. I was amazed. I called the wife over and I said, "I know this is humongous, but take a bite". She said "holy ****, is there sauce on that"? 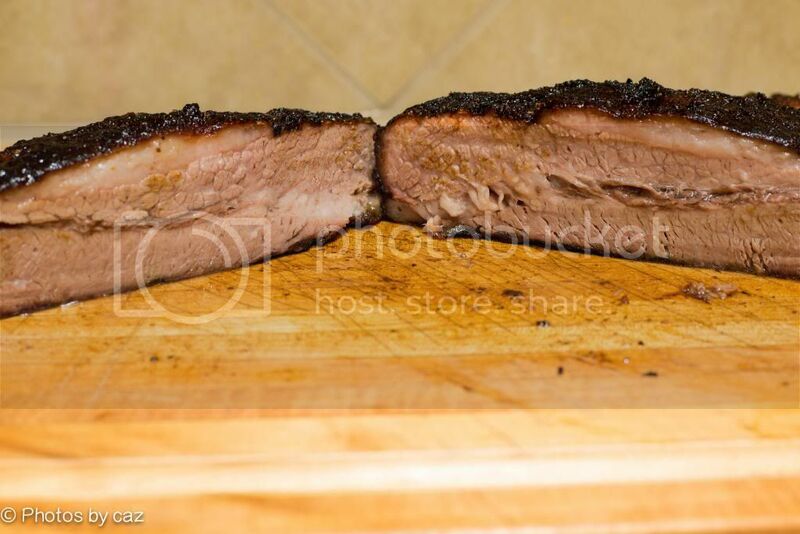 I tell her no and she asks for another bite, then said "that has to be some of the moistest brisket i've ever had. 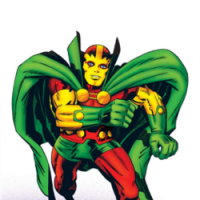 Make me one!" I built the sammie with point on the bottom with flat on the top so we were getting all types of goodness. Nice. .. I'm not cooking for you. Nicely done! One question...Do you deliver and what delivery zone would PA be? Might be time to reconsider the "small" briskets! You would have gladly crushed that one! Promise! That looks awesome. Haven't had brisket in a month and have been craving it. The brisket looks awesome from here. Could go for one of those sandwichs. 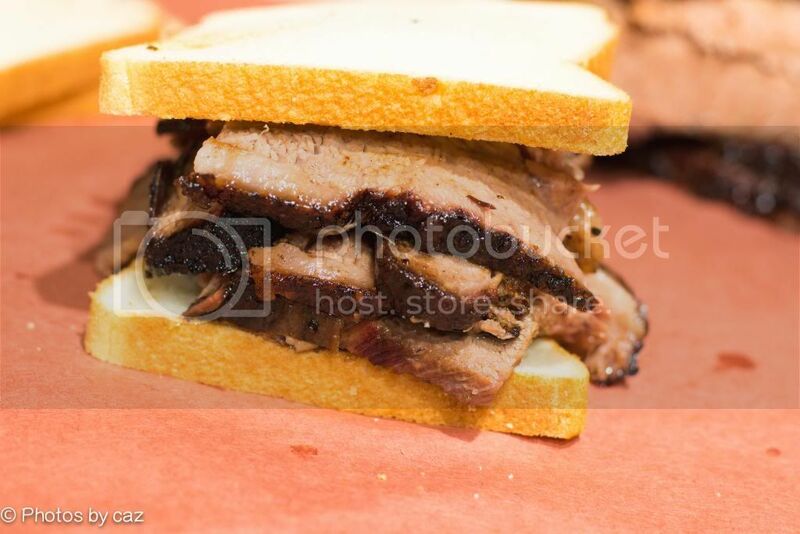 Nice job on the brisket and a tasty looking sammich! That looks awesome. I have a friend in the competition circuit. 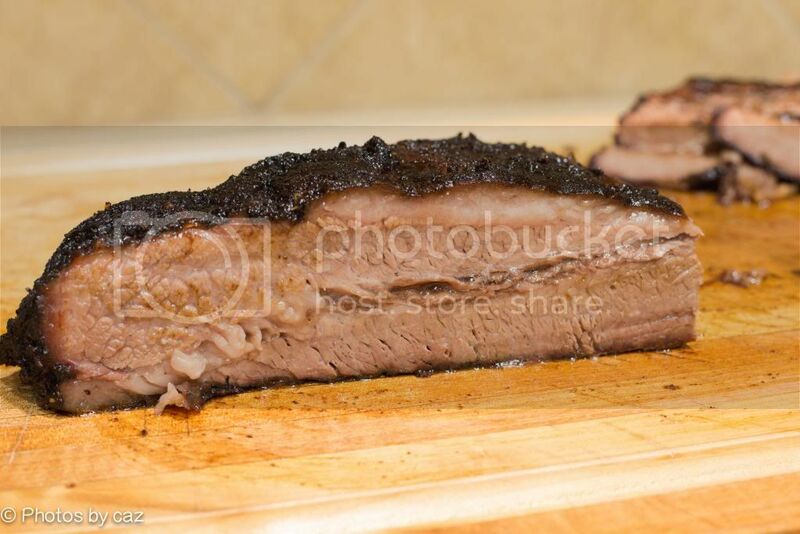 When he does brisket he has a piece of wood shaped like a half moon a few inches long. 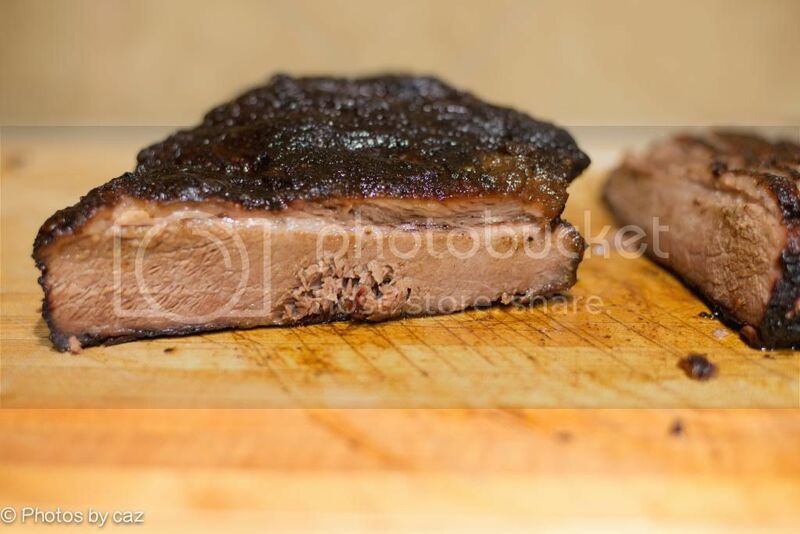 He puts it on the grill and the brisket on top and it raises the center a bit and stops the puddling. Cazzy. Would you share your recipe and technique?? A minimalist would be a perfect way to describe my bbq approach. I don't inject, foil, flip, spray, or baste. 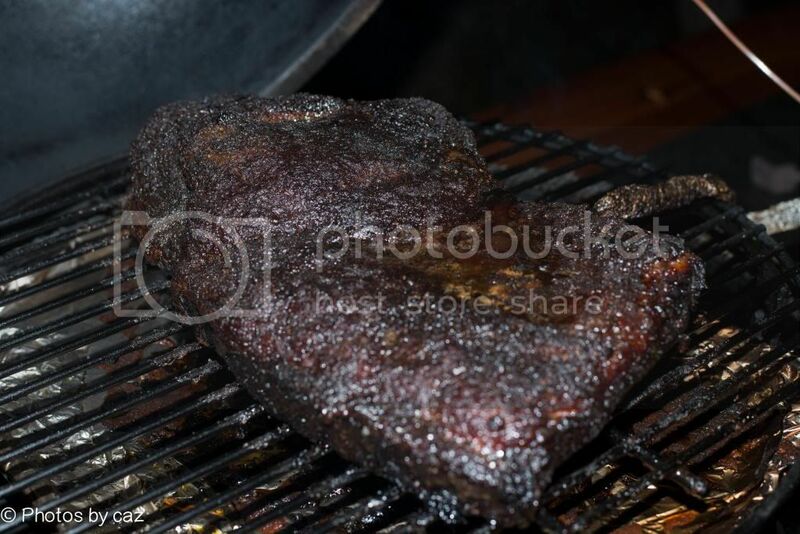 I have tried paper once on a brisket and didn't have luck, but i want to experiment with that again in the near future. I have tremendous success with paper on butts. Okay...onward to my approach that is down to very few steps now. - Check for tenderness on the flat at 190 to see how close you are. Do so every 30 min or at every degree change after 197 or 198 until it feels like you're probing butttttaaahhhhhh. - pull and wrap your meat in foil for a mandatory 1 hour minimum rest. - unwrap and carve against the grain. I don't even seperate the point anymore. When the grain changes on the flat as you're nearing the point, turn it sideways and split the point. Did you just say "pull out your packer"? What do you season with? Just S&P? I alternate between S&P and Texas BBQ Grand Champion.